I did a little trail maintenance this weekend. The big storms in the early summer put a tree down right across the intersection for three trail and right at the creek crossing. I cut the tree off the trails but at the time I was not able to move the stump out of the creek. I had really hoped that the flooding would wash the stump down the creek. However, after several floods, the stump stayed put. The trouble was that in order to cross the creek with a vehicle with limited articulation, you had to enter the creek where the bank was not so steep, drive along the creek and then exit at another place where the bank was not too steep. With the stump in the middle of the creek, this path was not possible. There was enough water in the creek most of the summer to make access to the stump difficult, so I just left it alone. Now that the creek has dried up some, I decided to get in there with the chain saw and see if I could clear the path. I began by clearing the mud off some of the larger roots. I did not want to damage my chain saw chain by trying to saw dirt. It seems nothing dulls a chainsaw blade faster than dirt. I used an adz to chop away the small roots and free up the entrapped dirt. I was able to cut off several large section of the roots and clear a path past most of the stump. I tried it with my off road Jeep. I could get by easily but I noticed that my rock rail was still hitting the stump as I went past. That would not bode well for street Jeeps trying to use the path to the campground. I cut off part of the tree stump that was still sticking up and I noticed that I could now move the mass of roots around some. I decided to try winching it. I could not get in a position to remove it from the creek bed. However, I was able to roll the stump up on its side and up against one of the stream banks. This provided plenty of room to drive past the mass of roots. I trimmed a few more of the ones that stuck out just to be sure. Driving by in the off road Jeep with 33” Maxxis Buckshots was no trouble at all. 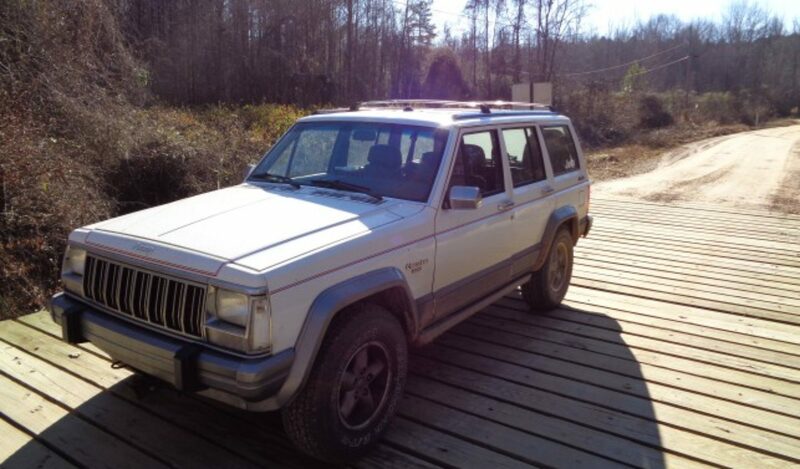 So after some rest and a drink, I decided to try my Daily Driver XJ. I had not trouble at all on the first pass. I went down to the campground and turned around. Getting back into the creek took some maneuvering to get the right angle to go past the stump. I went slowly and I sunk in the mud. I had to rock back and forth a few times before my 30” BFG ATs found enough bite to pull me through the mud. I think as soon as the creek flows some it will wash some of the loose mud away and make it more passable. Or if it stays dry, it will simply dry up enough to get through. Next PostNext Replacing the rear axle in a Jeep Cherokee.